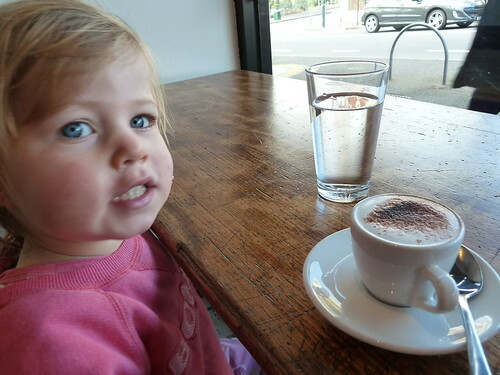 I had a conversation with an interesting person recently about the change in the way coffee in Melbourne tastes. No, I'm not talking about instant versus espresso but rather the coffee flavour and the milk consistency have undergone some sort of slow mutation. I remember when I first started drinking coffee, a latte was $2 and would often come with a serviette origami-d around it, I guess to protect your hand because it was so hot. 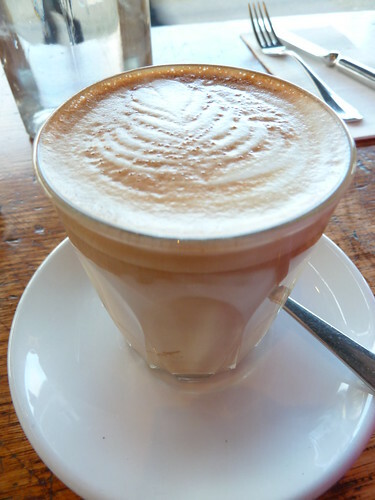 Now in trendy cafes, the coffee is barely lukewarm and the milk has a silky consistency so there is almost no distinction between the froth and the coffee at the bottom of the glass - kind of like a coffee milkshake, as this person correctly opined. The actual taste of the beans varies from the classic "espresso" taste of Genovese or other big name brands to very unusual flavours from the micro-roasters. 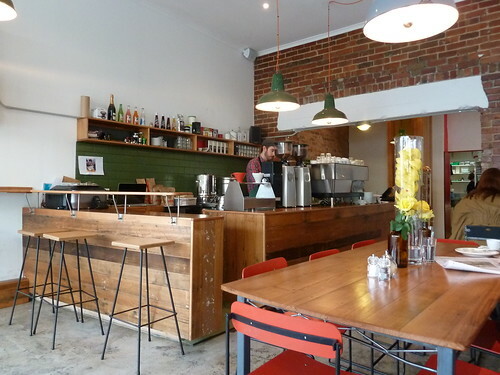 The Premises in Kensington is very much this newer style of coffee. 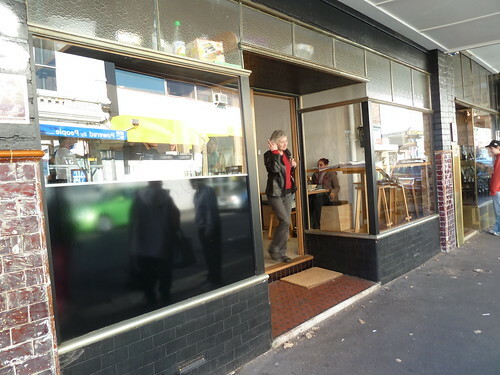 I love the space - two shops have evidently been joined so that The Premises has two street frontages, hugging the florist on the corner. The aesthetic is gorgeous with old wood, school-type chairs, lots of open space and light. The staff are all lovely - no 'tude here. Delicious, perfectly made coffee using Seven Seeds. The beans have a strange, almost smoky flavour though. It's almost like you can taste the oils on the beans. It's not unpleasant but gives the coffee another dimension. And what of latte art? We used to love Flavours of Lakhoum in Richmond where the barista would draw women's faces in the froth, sometimes apparently trying to resemble the drinker. It seems a bit naff now but it was so sweet at the time. 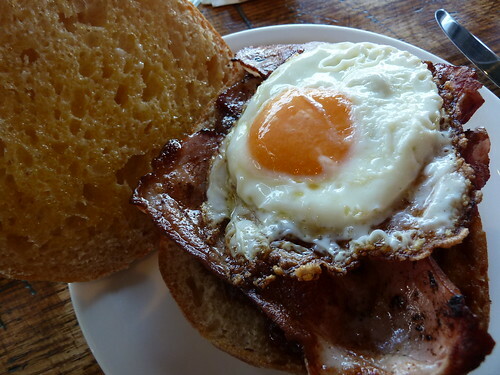 A good ole bacon and egg roll, this one with homemade BBQ sauce. It was enormous, football-shaped and half was plenty for an adult. Free range egg with "Newmarket bacon" (not sure what butcher or supplier this is?) 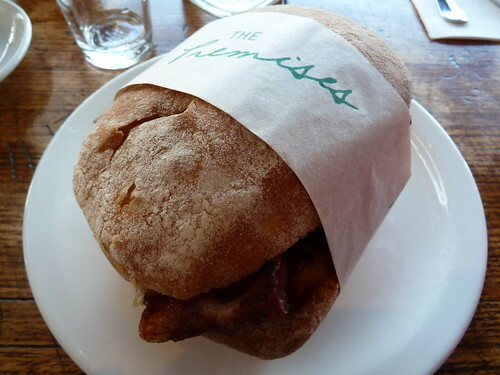 - the bacon was sensational, really smoky and meaty. 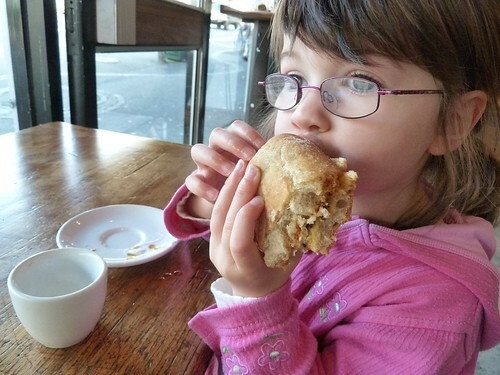 I do wish the roll was toasted, though, as there was a lot of bread and some textural variation would have been nice. I wish I could give you a spiel about how "I always choose the bacon and egg roll/caesar salad/spring rolls to give me a benchmark of how good a place is", but I can't. Sometimes you just want what you want. 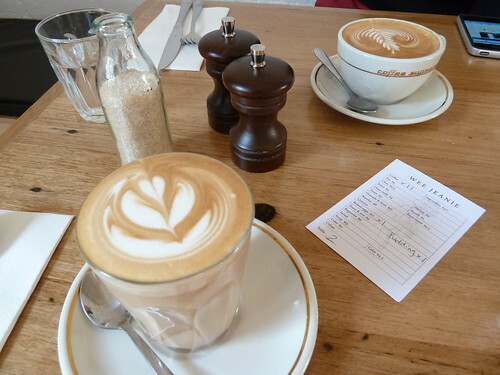 More great local coffee at the original "best cafe" in Kensington, Fruits of Passion. Their food is a bit stuck in the 00's but the coffee (Vittoria) is unreal. 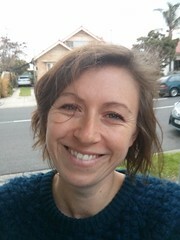 Footscray is changing, but it's more a waltz than a sprint, with two steps forward and one step back. I was excited when Yoghurt House opened because it was something different, a diversification of the usual restaurant/hairdresser/chemist patchwork of our suburb. 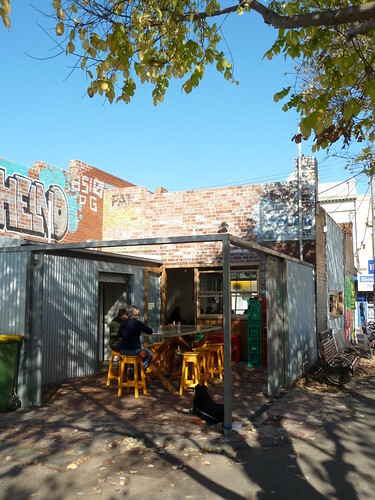 But then its neighbour Dimmeys shut down, creating a real black hole in Footscray's fabric. Yoghurt House got their window smashed, cut down their number of flavours and eventually shut their doors. This is why the reopening of somewhat tired Ha Long into the new and groovy Sen is very exciting. Not because I have anything against mirrored walls and buckets of chopsticks, but because it is great to have choice. Now if you want a classier Vietnamese experience, there's no need to jam the doors at Sapa Hills. 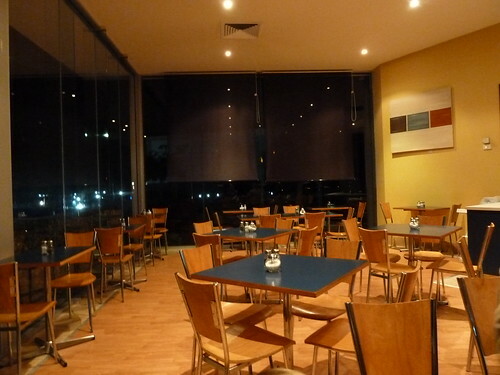 Sen is different because the decor is understated and modern and the menus are a pleasure to hold and browse. The staff wear a smart pink uniform and there are no TVs. 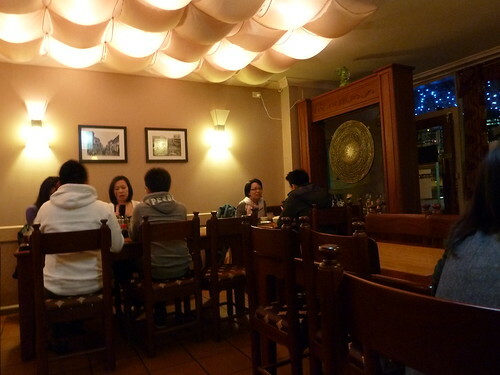 According to Billy, it was bought out by the chef of Ha Long, so one hopes that because this person has had experience in the restaurant, they knew what they wanted to change. Well, change not this, chef - it is unreal!! Banh hoi or "fine rice vermicelli" are little "mats" of very thin rice vermicelli noodles prepared somewhat like Sri Lankan stringhoppers in that they are formed by pressing through a sort of mincer and then steamed. They are traditionally hard to make so are a celebration food. Also here is chao tom or sugarcane prawns, a thick paste made of prawns and other seasonings, formed around sugarcane and grilled. It is so tasty and the sugarcane infuses it with a touch of sweetness. To eat, take a noodle mat, some sugarcane prawn meat and vegies and wrap in lettuce a la spring rolls. Dip in the seasoned fish sauce - swoon-a-licious! 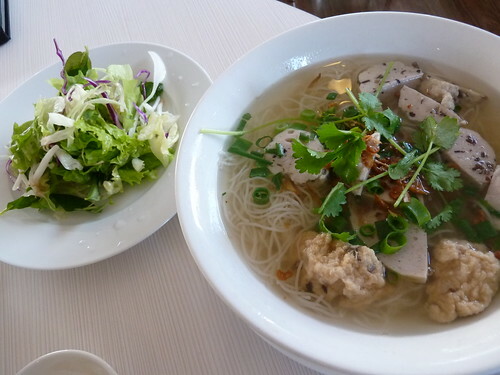 The rest of the menu has a northern Vietnamese bent, evidenced in this bun moc or pork meatball soup. 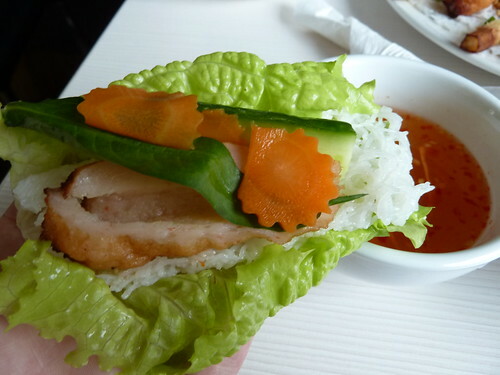 Deb highly recommends the bun moc at Dinh Sonh in Little Saigon Market. Like at Dong Ba, you take the plate of lettuce, bean sprouts and red cabbage and tip into the hot broth. This ups the vegetable ante and gives a lovely fresh vegetable angle to the meal that pho sometimes lacks. The broth here was tasty, clear and refreshing, while the meatballs were yummy little flavour bombs of pounded pork mince and earthy black fungus. Another Northern dish, grilled pork belly and pork meatballs as a DIY salad with vegies and vermicelli noodles. Just load up your bowl, tip over the thin, tangy dressing and dig in. I loved the thick, rich, dark soy marinade on the pork. This was quite good - I'm not sure a match for Sapa Hills' epic version but tasty nonetheless. 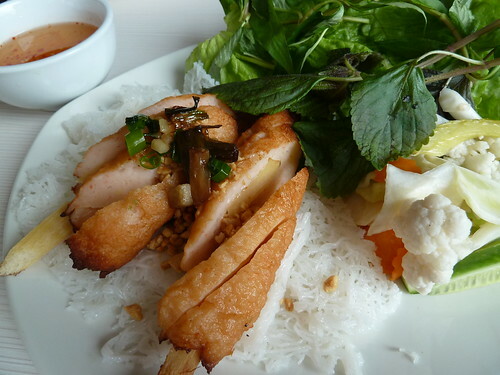 The dressing differs from the typical seasoned fish sauce in that it is not as sweet and somewhat milder in flavour. I am having some success with making my kids branch out from their customary grilled chicken and white rice with these bo la lot or beef mince in betel leaves. Kind of like a sausage roll! But green! These were pretty good - the mince was not too fatty and they were well seasoned. To eat, place in a piece of lettuce with herbs and pickled vegies (a nice and unusual touch) and dip in seasoned sauce. Pay $2 more and get the banh hoi version, I reckon. On learning these were for the kids, the waiter brought the dipping sauce without chilli especially for them. 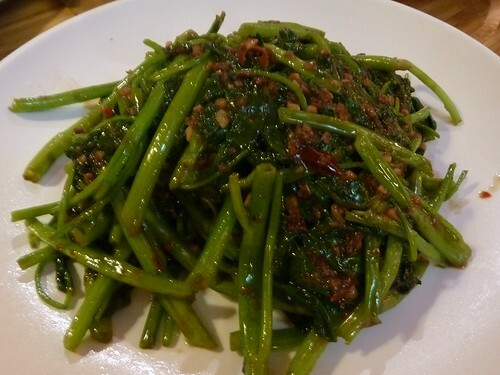 Ha Long was reputed to have amazing Chinese broccoli with garlic and this water spinach or rau muong was divine! The garlic must have been poached or pickled somehow as it had lost all its acrid intensity and was just smooth and almost creamy in flavour, just like roasted garlic cloves. Some of the stems were a bit woody but overall, an great dish. 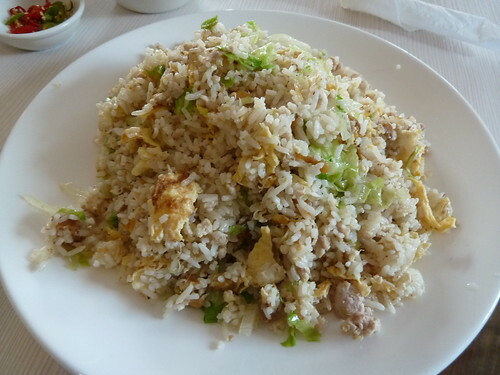 If you normally just eat combination fried rice, try something different with this fried rice with salted fish. The salted fish gives a delicious umami tang to the otherwise kid-friendly meal of white rice, lightly seasoned and tossed with egg, chicken and a little lettuce. Some of the pieces of salted fish were a bit chunky but the flavour was totally oh-yeah. 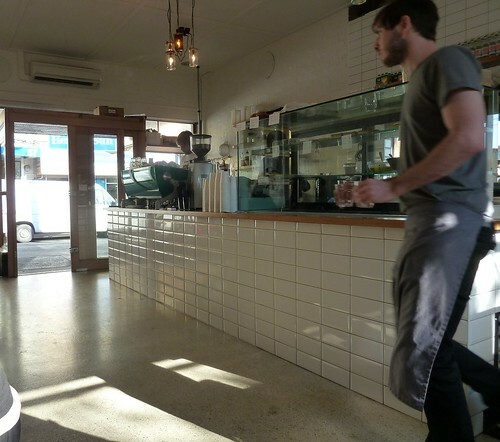 Think there is no good coffee in Footscray? Think again. 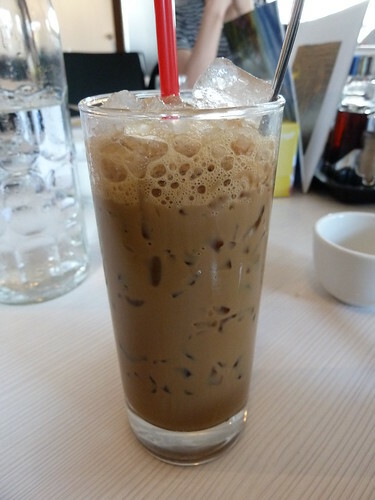 I love the jolt you get when you take the first sip of an excellent Vietnamese iced coffee like this one. Smoothies also got the thumbs up. 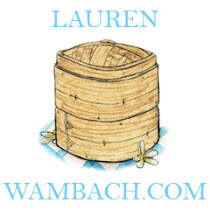 This is a great restaurant - they are very welcoming to kids and the service is friendly. Sadly they have none of their intriguing "Nem Sen" or lotus spring rolls as they cannot get the appropriate ingredient from Vietnam. 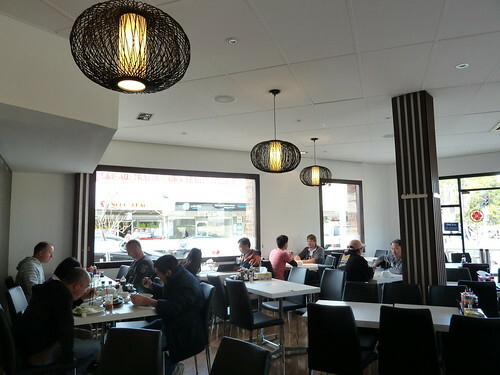 The list of bun or rice vermicelli salads is particularly impressive - Billy has given them a big thumbs up as having best bun thit nuong in Footscray! 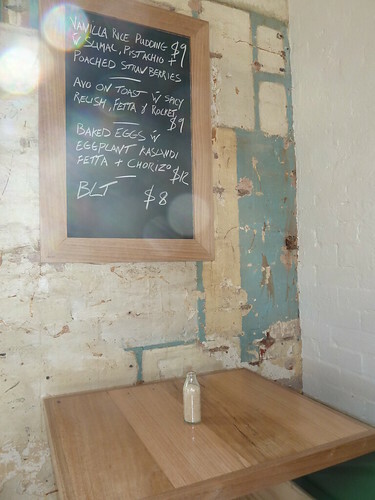 (Stop by Half-Eaten to see more Sen deliciousness). 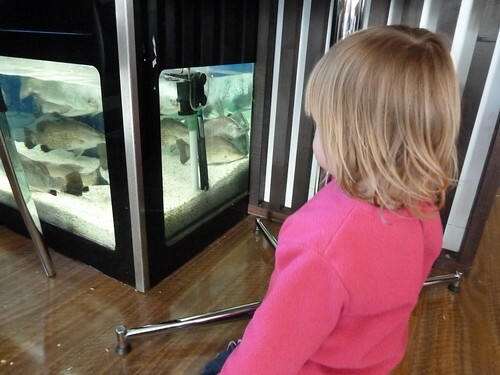 And who needs a TV when you have fish? My friend M is the anti-cool. Years ago he buttoned all his shirts up to the neck until that became hip, when he defiantly unbuttoned them back down. The mention of perhaps a little product in his hair prompts snorts of derision. He refuses to drink lattes, insisting on more proletarian flat whites. 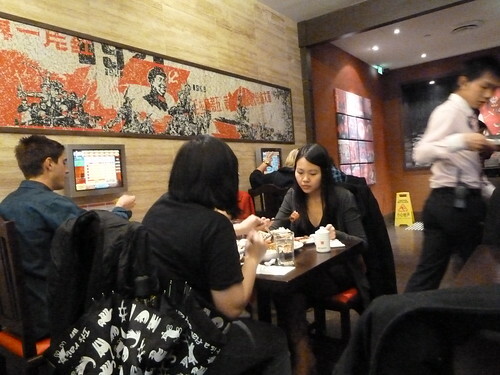 Looking for dumplings in the city one night, Hu Tong booked out, I suggested with some trepidation we try China Red. "It's trendy though," I said warily. "It's got touchscreens." China Red certainly still has a buzz about it. 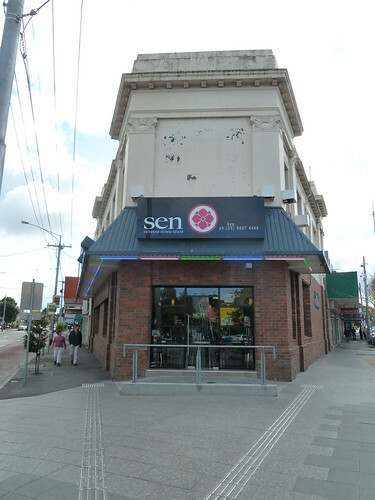 It's in the new centre in Little Bourke that also houses the fabulous Shanghai Dynasty, the mediocre Dragon Boat and Malaysian Jalan Alor that Bryan recently gave a gold star. 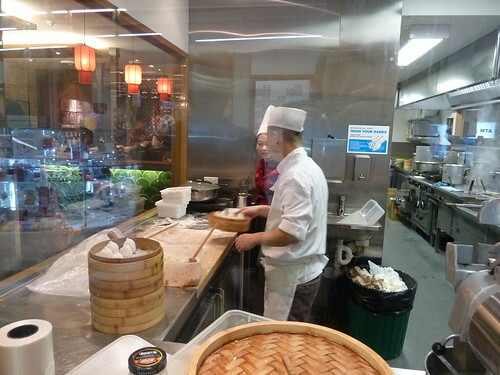 It seems a bit the poor man's Hu Tong with an open kitchen where you can watch dumplings being made plus a select range of said dumplings including xiao long bao, the soup-filled, floppy-bottomed little parcels Hu Tong has made Melbourne fall in love with. It's deceptively large with a second, windowless lower level. You are packed in tight but I quite like the aesthetic - simple, clean lines and bold colours. 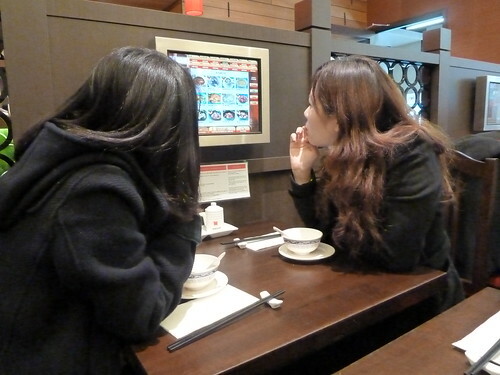 Ordering is done via the touchscreens that hover above the tables. 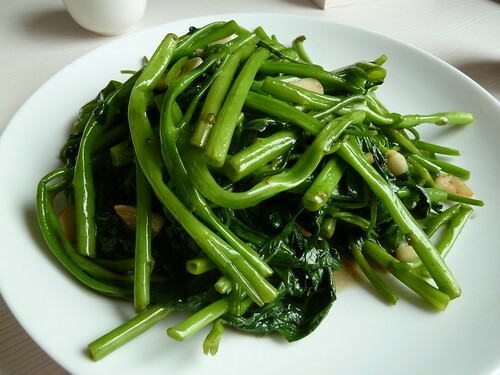 There's a full spread of dumplings plus various mainland-Chinese dishes like fried Szechuan dishes covered in whole dried red chillies and various sesame oil-dressed salad-type dishes. In the end, we didn't get to use the famous touchscreens at all! We were in the middle of the restaurant and received regular menus. The ironic thing is that this most modern of Chinese restaurants has gone back to the "number system" of suburban Chinese eateries. Where once families called up on a Friday night to order "a 19, two 24s and a 63", at China Red the happy waitresses need the numbers not the names (I think because they must input via the same system as the touchscreens). I have always wanted to try a "salted egg yolk" dish. I am sorry to say but yuck, yuck, YUCK. 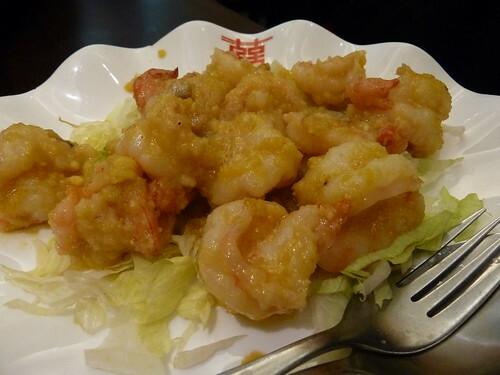 The prawns were really good, juicy, fresh and butterflied, but I hated the sauce - kind of crumbly, sandy egg yolk bound somehow with light sauce. I hate hardboiled eggs so I don't really know what I was thinking. 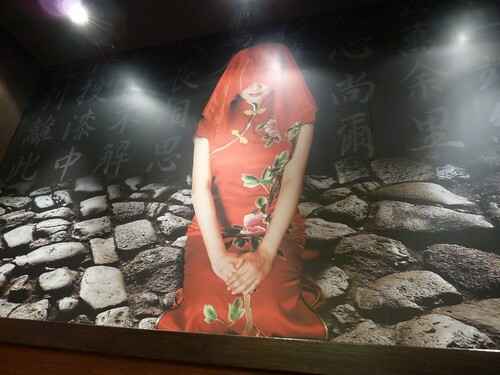 Not China Red's fault at all as I think this must have been well executed - I just hated it. The steep price made it ache all the more. We watched the chef making these as we entered. They do seem well made but they aren't as good as Hu Tong's, though. The mince seemed really fatty and the broth that came out did too, while Hu Tong's is much clearer and cleaner in taste. I liked these a lot, though. The mince inside was tasty, not grainy or dry, and the skins were pleasantly thick but not doughy. They had gorgeous fried bubbly bottoms. With the provided dipping sauce of soy and vinegar - very good. 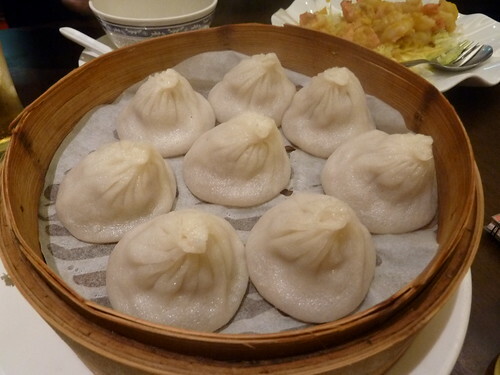 They are so much more expensive than the usual 15 dumplings for an insane $7 or $8, though. We were in and out in 20 minutes, I kid you not, but this simple meal with two beers and rice cost us over $65. OUCH!! I think if you choose wisely, you could have a good meal here. I am not that clued into mainland Chinese food to really pick well, though. I must add that the service was great. 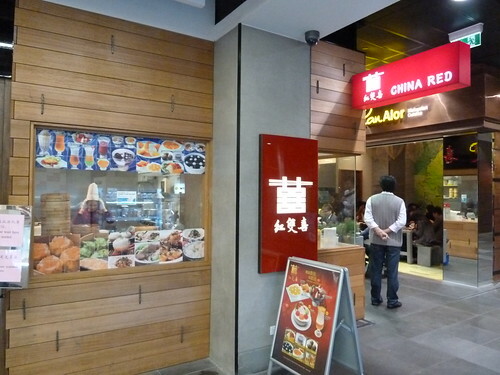 So where else in the city apart from Hu Tong is great for dumplings? Hipness optional. UPDATE: This restaurant is now closed. Kari Leaf is in its place and is reportedly not as good. Walking to Gurney Drive past window after window of happy people eating Korean BBQ, resist the temptation to text your friends "want beef ribs instead?" This small Penang-style hawker restaurant is worth holding out for. Gurney Drive is apparently the name of a famous hawker centre in Penang, an island off the coast of Malaysia, somewhat near the Thai border. 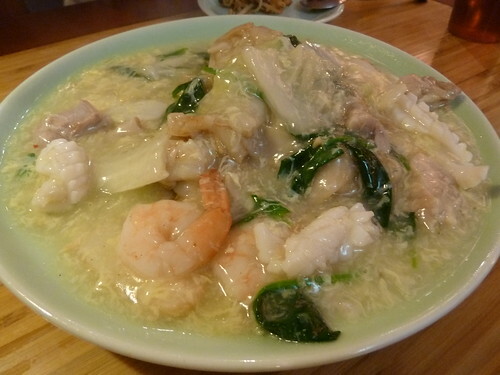 Penang is most famous for its Assam laksa which is a non-coconut-based laksa, dark and tangy with tamarind. THIS HAS COCKLES. I repeat... COCKLES. 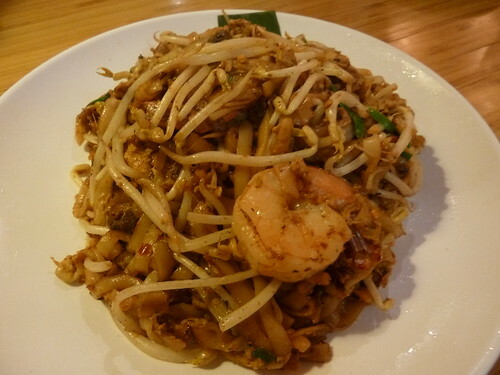 Here in Melbourne, it seems these tiny molluscs are the most elusive feature of authentic char kuey teow. 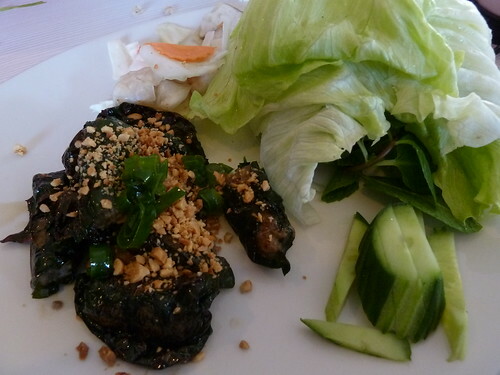 This version was unlike the Singaporean style which is much darker and richer from the dark soy used. This was lightly seasoned, had good chilli heat and really tasted fresh and lively. It was simply the sum of its parts, which were all good quality and so tasty. Thanks Wendy for the tip a while ago! This is a new favourite of mine even though at first glance it looks so unappealing with so much wet sauce on a small amount of noodles. The noodles here were the classic wide rice noodles, licked with wok hei and then buried beneath lots of thick, delicious, mild gravy. Very fresh prawns, calamari and fish cake featured and were divine with a little soy and fresh chilli. 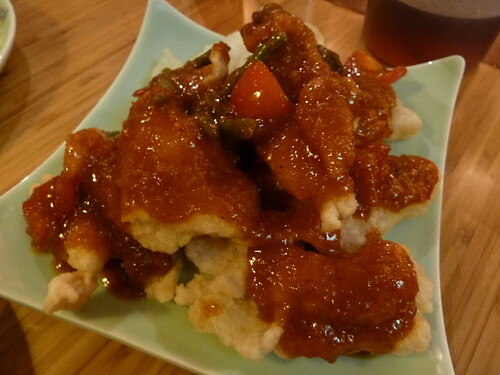 A heaping plate of rice flour-dusted, thin fish fillets, curled and crispy, doused in "Nyonya-style" sauce which was tangy with tamarind, ginger and tomato. This was well executed and tasty but I would try something else next time. I always think deep frying is wasted on things that then have a sauce over the top! I must have been a water insect in another life as I can't get enough of this aquatic plant, kang kong or water spianch. It grows like a weed across Southeast Asia and has intriguing, tender, hollow stems. You can see huge bunches of it in the markets in Footscray under its Vietnamese name, rau muong. This was so fantastic - cooked with sweeter Malaysian-style sambal, heady with belacan and dried shrimp and with plenty of well-fried garlic. 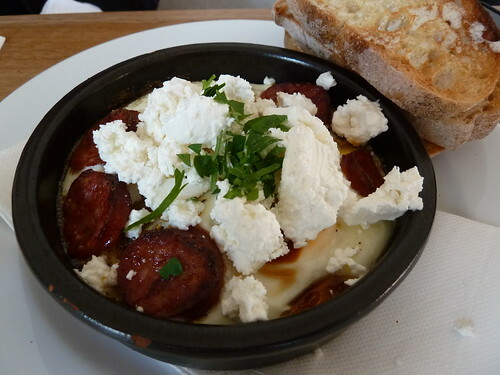 I loved it - I could eat this every day! 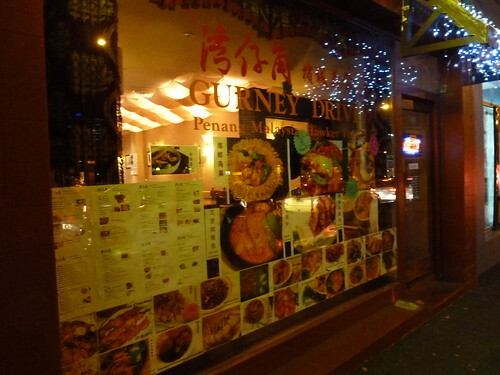 Gurney Drive was packed when we left with not a spare seat in the house, and for good reason. Two big thumbs up! Food in a business park - what springs to mind? Bowling ball-sized muffins, hot dogs in a water bath? It did to me at least. 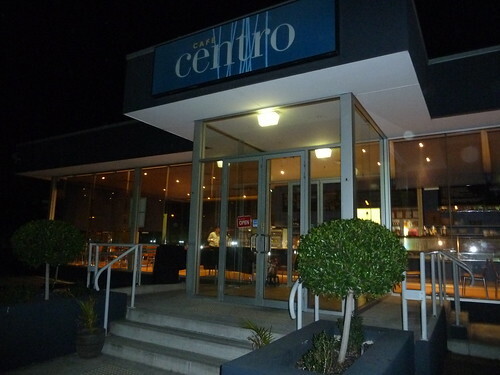 Who would have thought the unprepossessing Cafe Centro on semi-industrial Ashley Street metamorphosed into a Nepalese restaurant by night? These guys need to do some serious marketing. On a cold winter's night, the lights are dim and the entry concealed. No one would think to visit unless you had a hot tip (thanks Chris!) There's no helping the corporate vibe once inside but at least the cavernous space means the kids can run around without upsetting anyone. The menu has Indian overtones but with some Chinese accents, reflective of Nepal's location sandwiched between India and China. 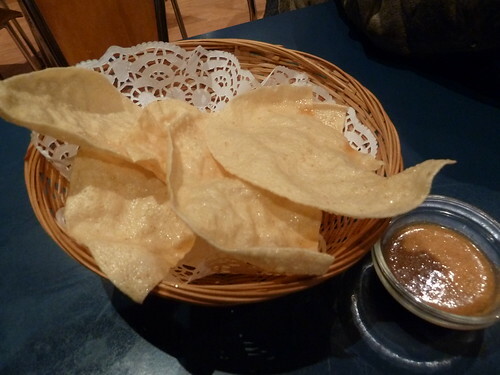 Complimentary pappadums to start with a quite lovely sauce made from ground sesame, chilli and tomato. 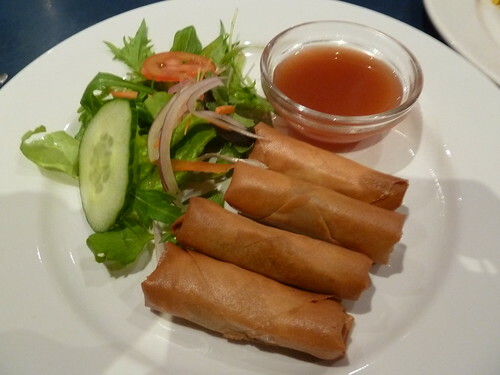 These spring rolls were quite nice, evidently home made and served with a light plum sauce. The deep fryer needed to be a bit hotter as both these and the pappadums were a little oily. Pleasant chicken wingettes with a spice mix that was quite unique - I tasted cumin, turmeric, salt and pepper. One was a bit underdone, but Grandpa still ate it! 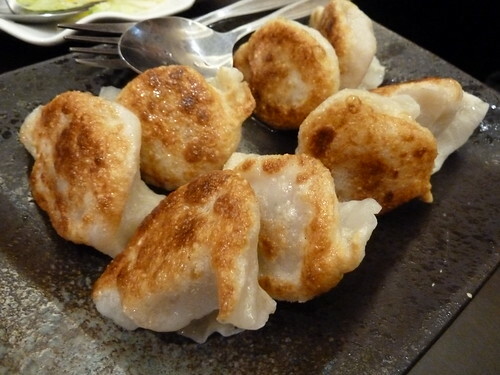 I think momo are so cool - they are a bona fide fusion food and are so delicious. 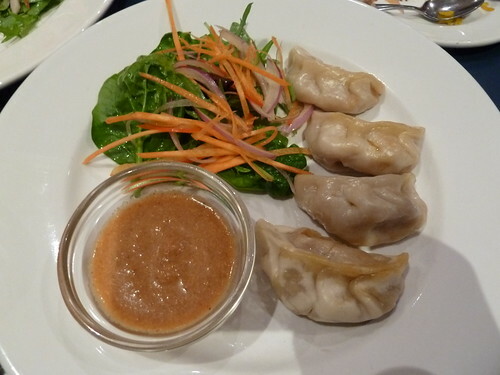 They look like Chinese dumplings but inside these vegetarian ones is a very Indianesque spiced, mashed vegetable filling. These were good but the steaming seemed inexpert as the skins had cooked unevenly and split in places. 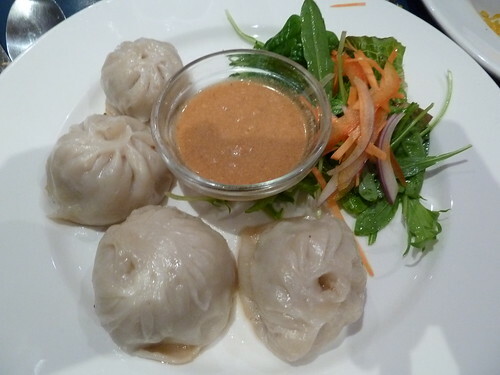 You can find good momo in Footscray at Fusion Cafe and Momo Bar. These meat momo didn't stack up to Fusion's, however. The filling was tasty with ginger but somewhat heavy and the skins had split. The price is also vastly incongruent - 10 for $8 at Fusion. Things picked up with the main courses. 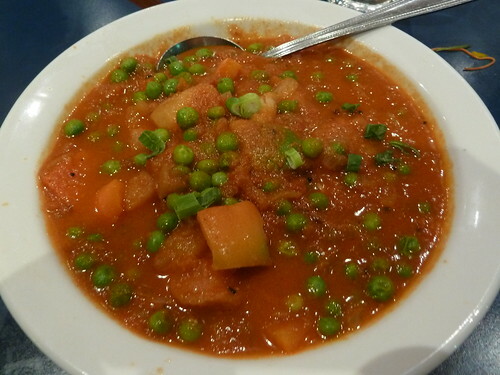 This was great aloo matar (incorrectly called matar paneer or peas with cheese on the menu). Unlike some more Northern-style Indian versions that have a thick brown curry sauce, the sauce was light, tangy tomato with a sprinkle of fenugreek leaves. I liked the addition of capsicum a lot. 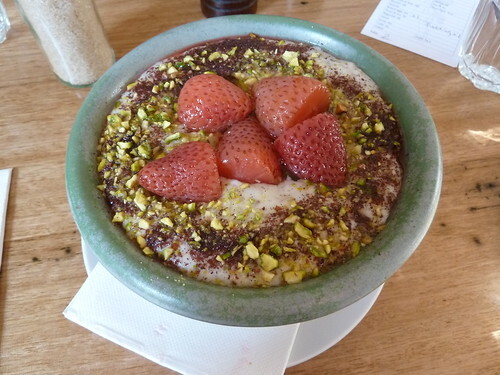 I actually got a child to eat this which is testament to how yummy it was. 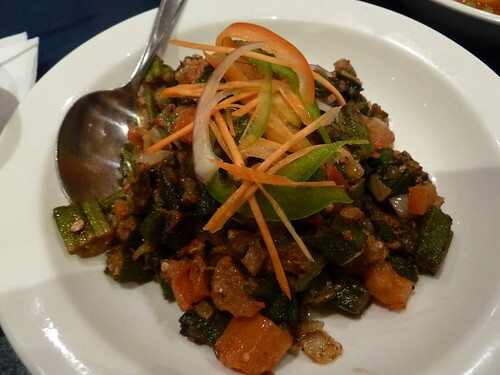 Excellent okra, diced and dry-fried with tomato, onion and chilli. This was simple and tasty with quality ingredients. Props that they had okra - in so many places when you order the more obscure vegetable dishes, they don't end up having them in stock. The menu says that "meals are served mild to fit local taste" - ask for spice levels to be authentic and you will be rewarded. 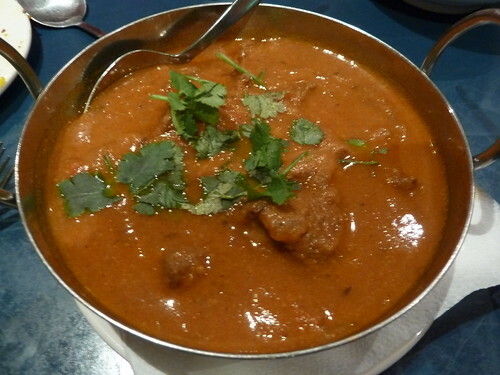 Boneless goat pieces in a very rich, thick curry sauce spiced with cardamon. This was good - some pieces of goat were fatty, others meltingly tender but I think that is authentic - the textural variation is part of the appeal and goat always seems very rich. 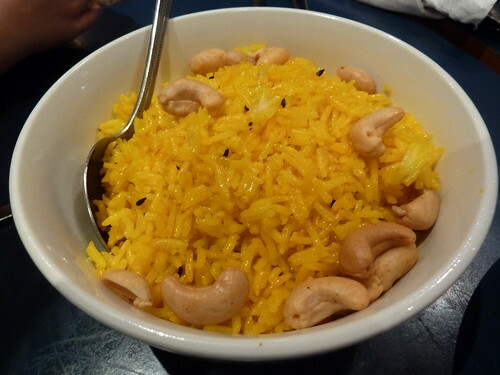 Oiled, seasoned saffron rice that was quite delicious. I liked the crunch of the cashews and peanuts. We had gorgeous, deep-lipped brass trays to eat our meals from. 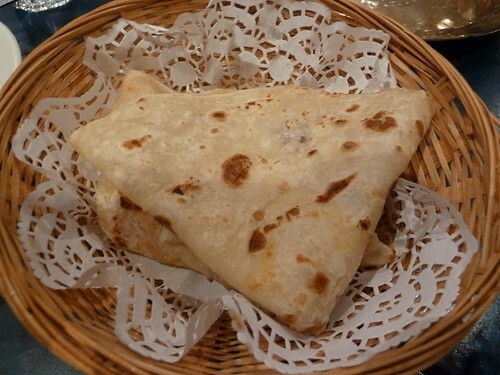 This was yummy roti, I think house-made, cooked as is traditional on a somewhat dry griddle so you get the contrast between the dark, flaky spots where it has touched and the tender pastry in between. 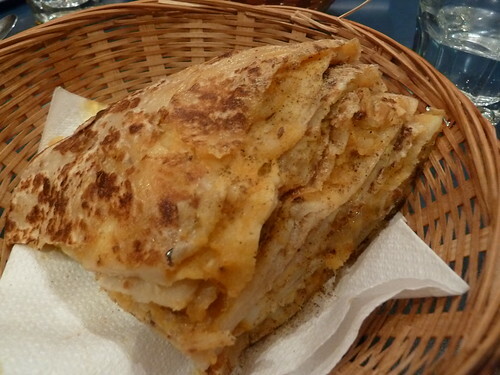 Roti stuffed with spiced mashed potato. This is really a meal in itself rather than a bread to mop up sauce. The potato was thick, tasty, spiced with cumin and well seasoned. As is often the case in Indian restaurants, the price here really added up fast once you add in all the entrees, rice and breads. 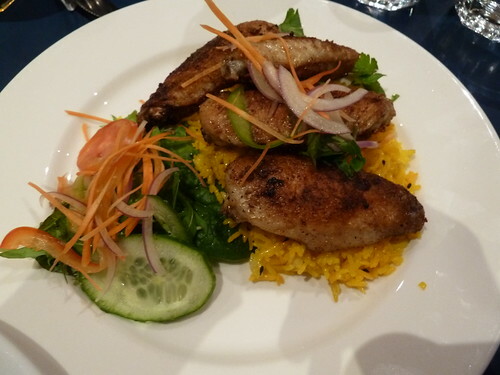 I did really enjoy the main courses - it seems like really authentic food, not overpoweringly rich like some restaurant Indian that is so inflated with ghee and cream. 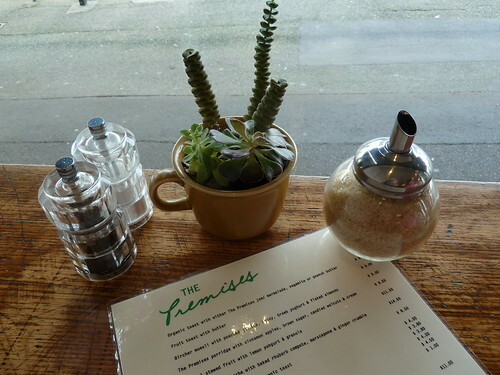 The prices seem steep for the location and atmosphere, however. Next time it would be worth trying the thali-esque dhal bhat masu or dhal bhat tarkari ($15.95) for variety but lower price, or one of the banquets which start at $20 per head.